We do love a bit of Yarn Wrapping! 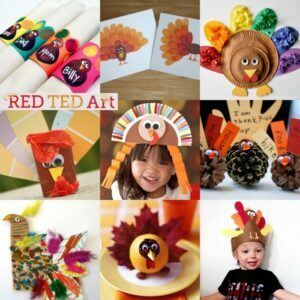 Tactile and great for fine motor skills and I do think the results are adorable, even if I say so myself!! Last year (or was it two years ago now?! 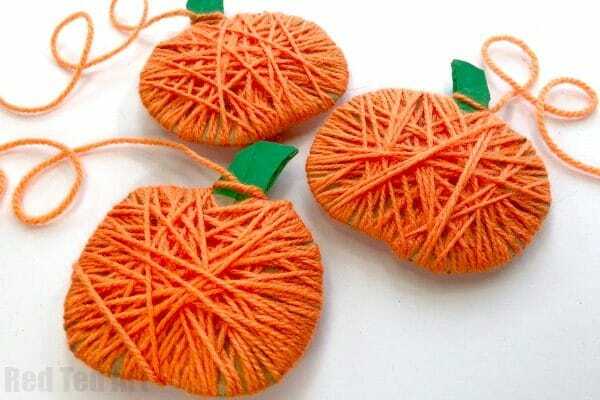 I just looked.. it was FOUR years go.. my how time flies (and how digress)) we had the most adorable Yarn Wrapped Apples.. this year, I have a special Yarn Wrapped Pumpkin Garland – not any old Pumpkin Garland mind.. but a REVERSIBLE one.. yep… make this now.. then during all of October you have the cutest Jack O’Lantern Garland to decorate your home with.. then on the 1st of November, flip over your Yarn Wrapped Jack O’Lanterns.. and hey presto you have a lovely Thanksgiving Pumpkin Garland. Actually, it would make a great Harvest Festival Garland too. Just perfect! 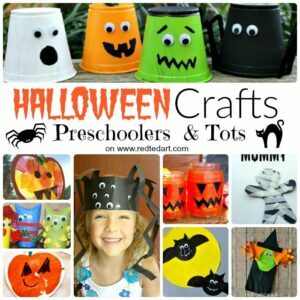 I think these make are great alternative to Turkey Crafts at Thanksgiving.. and a nice addition to our collection of Halloween Crafts for Preschool! The Little Old Lady Who Was Not Afraid of Anything! This book recommendation comes by lovely Instagram Reader Lizette! 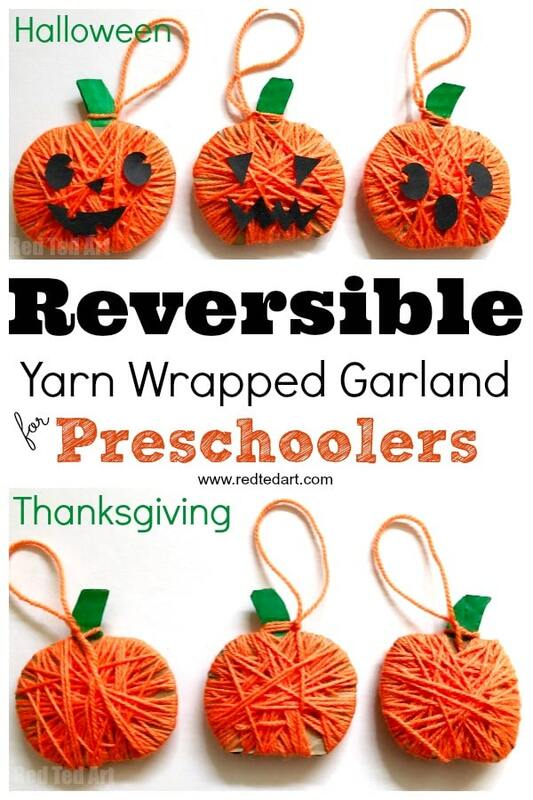 Who also shared her wonderful version of our Yarn Pumpkins! Aren’t they adorable!? Love all the different types. We love reading themed books that coordinate with the holidays. I try reading one book every night but I usually get suckered into reading more [Teehee don’t we all?!]. 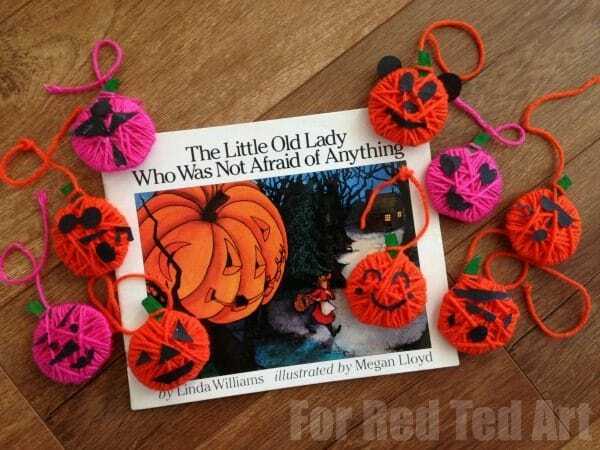 One of my favourite Halloween books is “The LIttle Old Lady Who Was Not Afraid of Anything” by Linda Williams. Why? Because at age two Lily Learned what sound each clothing made (you’ll understand if you you’ve read the book). 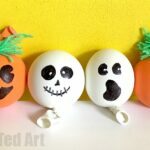 Lily abd I made these pmpkin decorations. I got the idea from Red Ted Art. It was the perfect craft to go along with the book. Check out our how to video instructions or follow the step by step photos below!! Also, for those of you who have asked.. you can see more re the Penguin Pen Pot here! 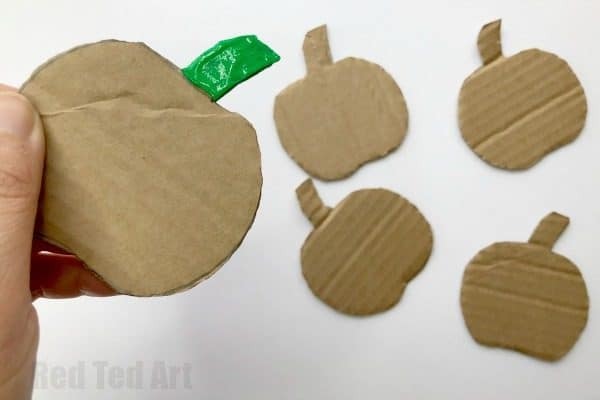 Begin by making your cardboard pumpkin template (be it for keeping it as a pumpkin or for making a Jack O’Lantern. Trace the tin can. Then take your traced circle and with the pencil sketch a slightly flattened circle – make it more oval/ pumpkin shape. 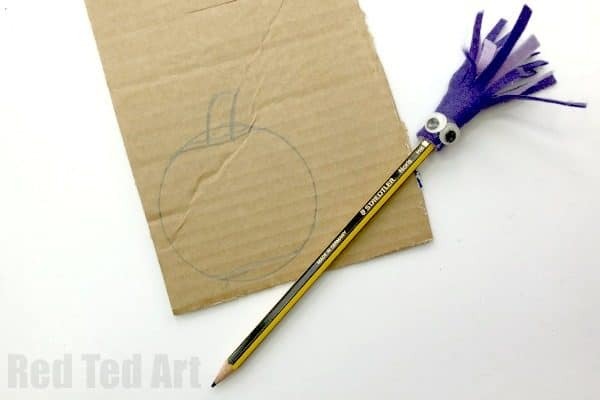 Add a pencil stem. Your basic pumpkin is finished! 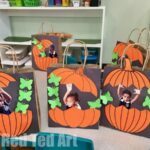 Cut out your template and trace and cut more pumpkins (I think 5-7 is a nice number!). 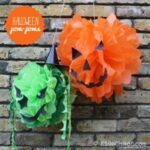 If you wish, paint your pumpkin stem green! 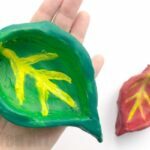 Now it does add some drying time to the process.. so you may wish you simply use green pens to colour the stem in or you could glue on a little green paper. Or you can even yarn wrap it with green wool. (Or paint it AND yarn wrap it!). 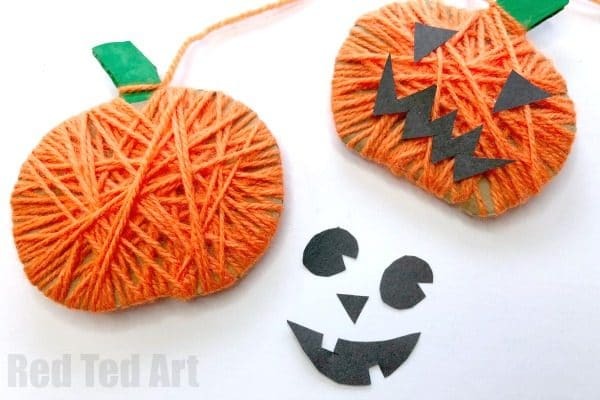 I cut a little snip at the top of your pumpkin to allowed you to wedge the wool in place to start wrapping our yarn pumpkin… then hand over to the kids and wrap wrap wrap. 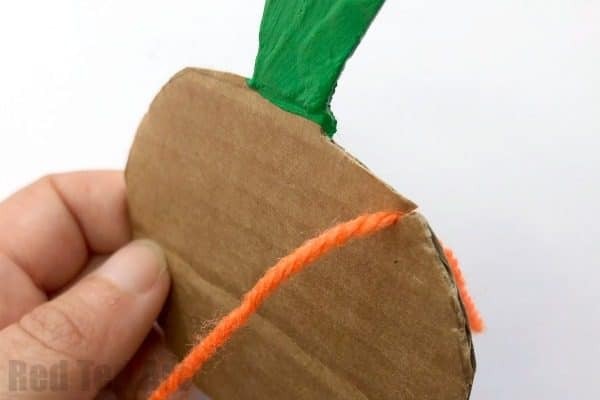 You may need to encourage younger kids to turn the apple as you go round, else you may end up with an apple with a big bulge all in one direction. When finished, we tied the yarn around the pumpkin stem and left a long ish piece for hanging our pumpkin craft. 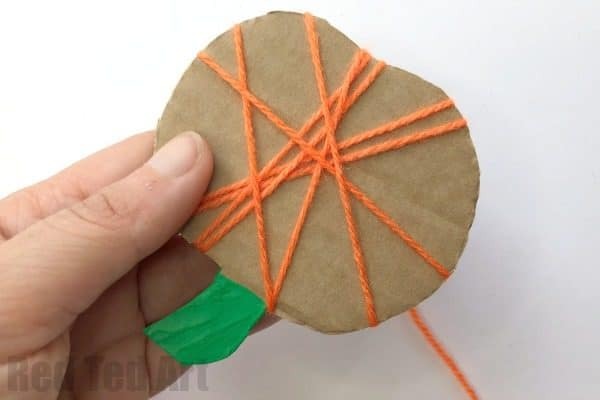 You can of coure tuck in the orange yarn and add a little green for hanging ( a bit like the pumpkin vines you sometimes get). 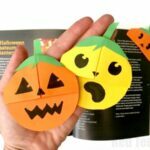 Time to add some jack O’Lantern features with either paper or black felt. And glue on. 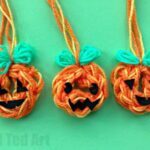 Simply tie your yarn pumpkins to your hanging string/ bakers twine and hang by your mantle piece of door way. 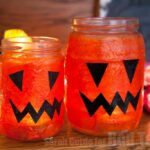 Turn all the Jack O’Lantern faces forward for Halloween and reverse again for Thanks Giving! DONE! Love a two in one craf that you can enjoy ALL seaons!! 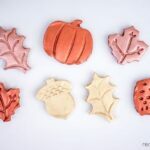 I love these double duty fall crafts! Thanks for the great tutorial!